British soldiers may be encouraged to wear their uniforms while off-duty in an attempt to boost their popularity with the general public. The possible move is part of an ongoing review into how best to improve the public's perception of the military. Labour MP Quentin Davies is conducting a review of public attitudes, which may also recommend a warmer community welcome for returning troops. Safety concerns first prompted the move to discourage uniforms unless on duty. The policy, which is officially a recommendation, stems from the IRA bombing campaign in the 1970s when military personnel were perceived as targets. "No-one is suggesting soldiers go to nightclubs in their uniforms," Mr Davies told the BBC. "The question is whether the armed forces are too reticent in wearing their uniforms." A spokesman for the MoD said currently soldiers follow the advice of their commanding officers on whether or not it is appropriate to wear uniforms while off duty, but most choose not to as a matter of personal safety. In a bid to improve the public's attitude towards the armed forces, Prime Minister Gordon Brown and Armed Forces Minister Bob Ainsworth asked Mr Davies in December to study the issue and report back with recommendations. "We should be proud of our armed forces; they are a vital part of the fabric of the country, Mr Davies said. "The present situation is certainly a very artificial one." He is not expected to issue his findings for two months, but he told the BBC he will recommend soldiers wear their uniforms more freely in public. Other possible recommendations include more parades to welcome home units returning from active duty in Afghanistan and Iraq, a greater public presence at major events and open days at bases and airfields. Returning British soldiers have been met with mixed reactions from a public that does not wholeheartedly support the country's involvement in the Iraq war. 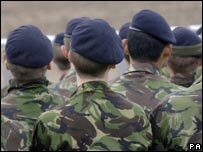 The MoD spokesman said the review is an attempt to find a way to ensure the armed forces are better appreciated and understood by the general public. "The whole process is going to be looking at what the nation as a whole can do to better recognise and acknowledge and celebrate the role of the armed forces," the spokesman said. In September of last year, the former head of the Army said more should be done to acknowledge the work done by troops. General Sir Mike Jackson said the nation should "value" its servicemen and women. Mr Davies task includes gauging the public's feelings when they see a soldier in uniform and determining whether or not it bolsters the image of the military as a whole. The review came after a spate of stories signalling that the public lacks support for the forces, including a woman who complained when disabled veterans were using public swimming pools as part of their rehabilitation and were told to leave. "There's a lot of evidence of increasing divergence between the armed forces and the rest of society, said Mr Davies. "That's not in the interests of either."